Project Objective: Build a world class cruiser that has that timeless Hot Rod look. Project Summary: The first call on this car came from Beirut, Lebanon. 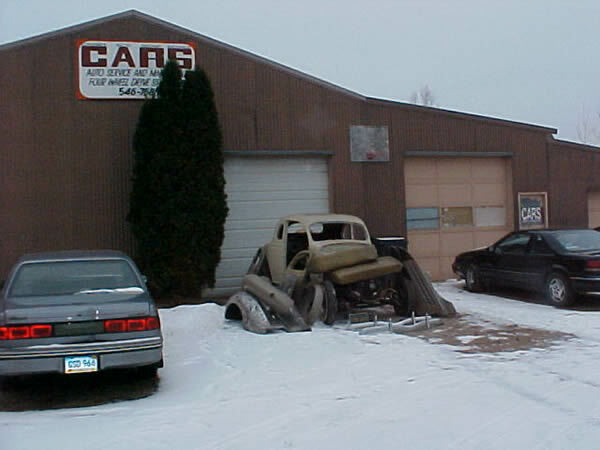 It had been fraudulently begun by a "restoration" shop in Minnesota. We rescued it and are well along the road to building a high speed, effortless touring, classic. Worse case nightmare!! This is exactly how we found the car. Fully half the pieces missing and the expected help from shop owner no where to be seen. We had to go find shop owner (had been out all night hitting the bottle). We had to alternately threaten him with the Sheriff and bribe him with another bottle to get him to come down to his shop and let us in to find the rest of the parts. Tom, our painter (and former teamster) , and Dave our fabricator, spent the entire day inside and outside searching for the parts. Parts buried in the snow, in the scrap pile, in other cars parts piles, unbelievable.